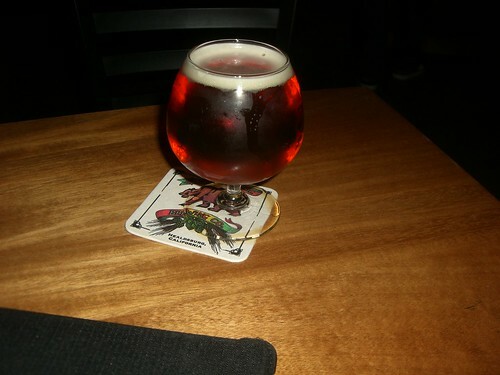 The first ale I chose for the glass experiment was Deschutes’ Mirror Pond. I picked this ale for two reasons: I like it and I know how it tastes. I hoped that this would give me a solid baseline: since I know what Mirror Pond is supposed to taste like, I would have a better sense of how it was affected, if at all. Here’s what we noticed: Nose was nice in schooner but there was less nose, in the pint glass. I noticed more malt flavors in the mug and the brandy glass not much nose, at all, initially. I wondered if a short pour as effecting the experience: as you can see from the photo, the brandy glass has the least head on it of the four. My girlfriend caught more scents than I did but said the flavors was largely unaffected. She didn’t like the weightiness of the mug–which I tried to suggest wasn’t really what we were testing for but upon discussion I had to admit was part of the experience. She got more nose in brandy glass than I did, which I was surprised at because there was no foam on top. The pint glass had and kept foam best, with the mug a second, yet the schooner offered more scent than the mug did. We agreed that these differences in Mirror Pond were subtle. Very, very subtle. We made a mistake by pouring all four beers at once, which caused us to hurry through each of them at first, trying to get scents, and then work our way through the rest of the experience slower. It made picking differences out more challenging but I will point out that because each beer was the same, plucking differences out should be difficult. Regardless of the challenge, in the future we’ll have all the beers on the same evening but two at a time so we don’t have to rush. As we drank, I got much more nose from brandy glass-too much. By the end of the floral notes were almost sickening to me. That was a very, very confusing moment because no other glass provided this experience. Also the mug kept the beer coldest out of the glasses. We proposed that it might be better for lagers. She liked the lager glass then the pint glass, the brandy glass then the mug. I went pint, lager, mug, brandy. Conclusions: this won’t make a bad beer better, nor a good beer excellent but each glass does push some style points of this beer further than others. So the first thing to say here is: I was wrong. The glassware does have an impact. I am genuinely surprised by this. I still believe that most people can be forgiven for not caring about the glass much and I don’t think that people should become snooty about their glassware because those differences were small, gentle ones and not really enough to change lead into gold. I feel that a wonderful beer will show its true colors in any container. But the glass could brighten (or dull) a beer in a few tiny ways that could affect a patron’s enjoyment and sometimes those little changes make all the difference. After much searching and a little sampling (thank you, Bailey’s staff, for patiently indulging my indecision) I settled on a 21st Amendment Baby Horse. It was a Belgian Quadrupel and this is one of those styles that can be amazing or can really be too sweet and not finish well. However, 21st Amendment has made some excellent beers. I trust them. This beer had a cinnamon note on the front, which followed through to the beginning flavor, then went overly sweet, finishing like an orange gumdrop. “So it’s disgusting,” a compatriot said, once I described it to him. Yes. Yes it is. It’s not Maple Bacon Stout disgusting, it’s not so horrific that I think that there was some kind of huge mistake…except that wow, this feels like a mistake. The flavor notes are supposed to suggest spice and ripe fruit or even have a dry finish similar to white wine but this is just not even close. Spice, OK, orange, OK: that is, I can see the argument for the presence of those flavors but not in this presentation. I can’t recommend it. Maybe someone else can appreciate it? It is difficult for me to imagine a brewery as solid as 21st Amendment releasing a beer that, to me, is so weird and offputting. Not every beer is for my palate, of course, but still…I usually endorse what they do. So this feels weird. I wait, writing something completely different, unable to connect my thoughts together. It’s been like that for the past few Mondays. I don’t exactly know why but I don’t question it. I am writing and it’s part of the work. Some days are more challenging than others, which is the nature of the beast. My job is to show up and do the work and sometimes, we’ll all just admit that the beast gets the better of me. In meantime, the beer gets a chance to warm up and perhaps that will help reveal some flavors that weren’t there before. I have to admit, the ale does smooth out a touch. The transition between cinnamon and gumdrop aren’t as sharp; both ends of the beer have muted themselves into a blend that ‘harmonizes’ them. But I put that word in quotes because it just isn’t a harmony I find appealing. And I’m glad it wasn’t me. 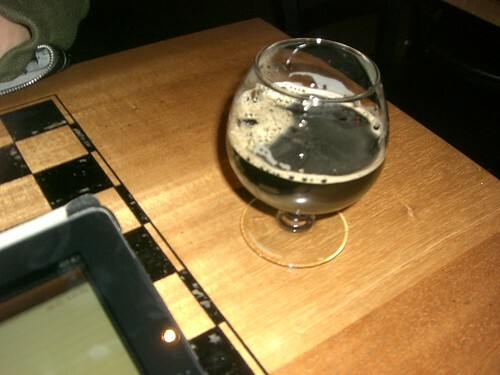 On the other hand, someone researched the best beer bars in America and I’m sad it wasn’t me. I don’t know how one becomes a part of that research committee but I want in. I’ve made comment before about how I believe the ‘proper glass’ to be a bunk idea. And I have been called out on it. I chose these glasses because they’re pretty solid approximations of what might be used to present a beer in an actual pub. I will admit they are not be 100% accurate but my hope is that they’ll be close enough that my results will be credible. What I’m going to do is get a commercial beer, pour it into each glass and try it, taking notes. Each beer will be drank it its entirety. The hope will be to determine if the glassware is impacting my drink and how much that matters to my enjoyment of the beer. Same set of glasses, every time. 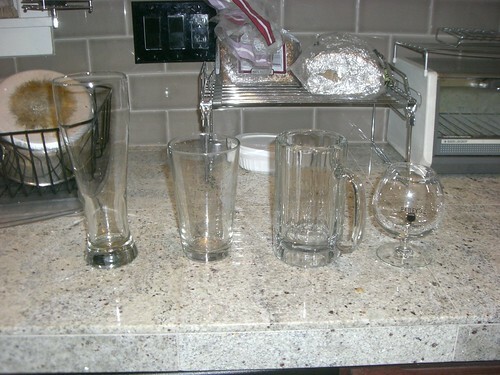 I have a lot of pint glasses but I’ll be using the same one every time in order to reduce variance. While I feel that a pint glass should be the same world over, the truth is that one pint glass may be a little different from another. I don’t want the results to appear tainted because I changed a glass. 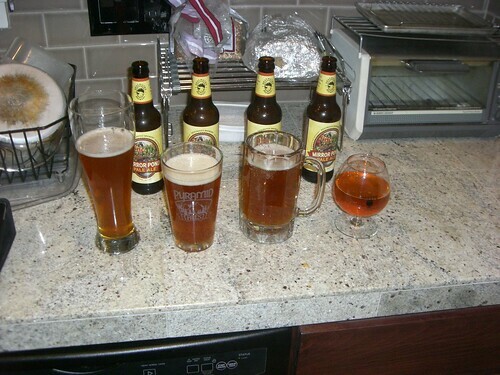 Commercial beers as samples. Homebrews, as consistent as they can (and should) be, cannot compare to the kind of near-certain quality of a commercial beer. Since the goal is to discover whether or not glassware impacts a beer and how that affects the experience, the base for that experience has to be the same and again, to avoid tainting the results I want that base to be built by a professional. Multiple beers will be sampled over the course of this experiment. There are just too many styles of beer out there. To run the experiment with an IPA and then presume those results would apply to all other styles is foolish. I won’t get to every style of beer but I will run the experiment multiple times with different beers, so readers can see how things play out. I will have at least one other person to try the beers with so we can compare notes. This will usually be my girlfriend. Beer judging has long been a collaborative thing and I see no reason to change that. Again: this will help refute any bias I may have and provide better results. All glasses will be cleaned prior to use. Just so we’re clear. I think that covers it. I’ll have some results very soon. “You don’t get both,” I said to my girlfriend, as she held up a stout and a Train Wreck from Butte Creek, a barleywine, comparing them with a critical eye, sniffing from each glass deeply. She ponders and chooses the barleywine, leaving me Boulder‘s oak aged oatmeal stout. I can live with this. She takes a sip and makes a face. It’s not hoppy enough, she says and though I’m not sure that a hoppy barleywine is to style, I am not in a position to argue. Something seems strange about it, that’s for sure. I can’t place it but the beer doesn’t finish with that kind of smooth maltiness I would expect nor a hop-like bitter note. Instead there is a sour note to it which suggests that there’s something else going on. What, I just don’t know. She tries some of my stout and makes another face: “Something like burnt rubber in there” and crazily enough, she doesn’t like that. I don’t get those flavors but I do get s a touch of antiseptic, as if this ale was too clean. It’s also not the way I would expect a stout to taste. Something isn’t right and I can’t put my finger on what. Some nights, there are misses. But only insofar as the beer is concerned. The bar is still a bit on the low key side (I think the cold is still keeping people away) but it also seems more boisterous than last week. There is a vibe in the air, as though people are resisting the dark nights more. Maybe I’m just imagining it and the music is louder but it feels like people are snarling at the cold, reminding winter that it can’t keep us indoors. I’ve got great company, so the beer can take a backseat for once. I suppose the obvious question is: who is this beer for? People who love Bud have no reason to upgrade, people who have moved on from Bud have no reason to give them their money because they’ve found better alternatives. I don’t disapprove of Bud having tiered products but if all you’re doing is the same style “only better” how do you give a statement like that meaning without destroying the rest of your products? Full Sail, for example, will occasionally do a lager under their house name but also markets Session, which barely mentions the Full Sail brand. The cheap Session beer doesn’t taint the other ales they make because it’s clearly different. Black Crown is obviously branded by Bud that it doesn’t have this luxury. In comparison, there is a very clear audience for beers brewed under this kind of vision. The link takes you to a story about how New Hampshire is encouraging nanobreweries- places that brew less than 2,000 barrels a year. If it hasn’t happened yet, I would say that I believe this is the kind of place that companies (I hesitate to call them breweries for…admittedly elitist reasons) like Bud should put their attention towards. Use these tiny breweries to try crazy things, let your super smart scientist brewers have some fun, and when they come up with something marketable: Bingo! Widmer certainly does things like this, and some smaller breweries around town like Coalition have similar homebrewer-outreach programs, if you will. A similar idea is used in some tech companies too, where they let their staff just play around on things once a month. It’s worked out pretty well for places like Google. Not that I want Budweiser, or any large brewer, to be in every brewery. That’s inane. But when people are running their own experiments to make stronger beer, it may be worth ignoring the business model for a little bit to see what unfettered imaginations can do. Pretty crazy, right? 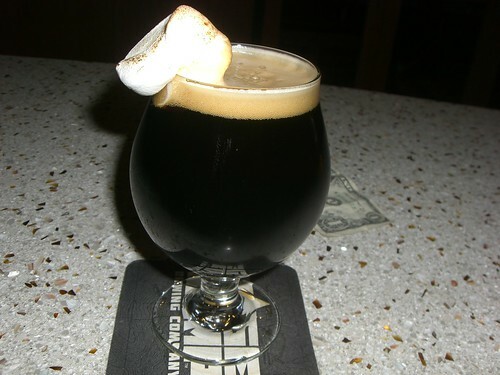 This is the Base Camp S’mores Stout, which is really just their regular stout with a toasted marshmallow put on the side. It may be a gimmick but it’s a gimmick that works. The toasted marshmallow really does change the experience you have with this ale. The caramel elements trick you a little bit, because they don’t show up on the tongue, yet the brain is telling you that you’re smelling something carmely! It’s a fascinating exercise in how much influence our nose can have over what we taste. Of course, this beer wouldn’t work if the stout wasn’t good and I’m pleased to tell you it is. I also liked the layout at Base Camp’s serving area. Spacious and reasonably well lit, with a long, broad bar that allowed for pizzas or a comfortable spot to rest your arms while you read. There were lots of styles to try so I’m looking forward to returning to see how well the other beers hold up.